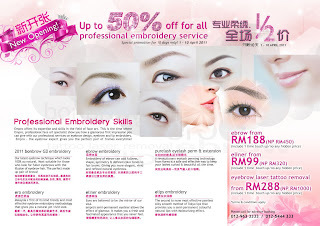 Isabel Lee | Malaysian Beauty & Lifestyle Blogger: Last Chance to Have Nice Brows at Half Price! Last Chance to Have Nice Brows at Half Price! The 50% off at Empro ends tonight at 10pm (offer has been extended). If you still want to buy it but missed the chance, don't miss out again! Call 012-5444 333 or 012-963 3333 for booking! You can even do online banking if you can't make it to Ikano tonight.